Webinars a very popular online marketing strategy for selling high-ticket products. They’re an effective tool for getting a highly engaged audience that is interested in your information and your pitch…if you do it right. That’s what this template package is all about – helping you with creating your sign up page, your presentation, your pitch and more. 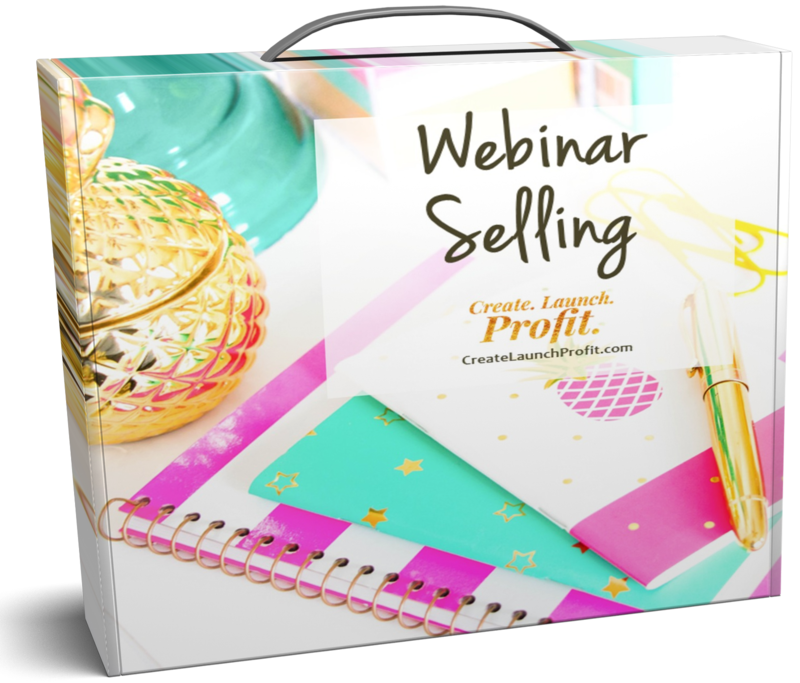 Before we get to the tools, let’s give you a good overview to selling on webinars. During a webinar, there are different methods you can use to keep your audience with you. Because let’s face it, we’ve all been in webinars where we check out half way through or worse, we click away. By asking questions, delivering information that’s visually engaging, and by actively engaging with your audience member, everyone will feel involved and part of your event. One of the main reasons that webinars are successful sales tools is that you’re able to capture your prospect’s attention for a significant period. A person may spend less than a minute reading an email or visiting your blog. It may be under 60 seconds. However, with a webinar you have their attention for up to an hour, giving you much more time to earn their trust and to motivate a sale. To be most effective, your webinar content will be targeted toward a specific group of people at a specific stage in their buying cycle. That means tailoring your content to that stage in their cycle. A webinar can step in and help transition prospects through your funnel faster. Oh yeah, this image was made using one of the product graphics included in the Sales Page Funnel Templates package - and I didn't need Photoshop to create it! Webinars are an effective marketing tool when they focus on providing your attendees an exceptional experience. They leave the event not only excited about your company products or services, but also motivated to continue moving forward with your business and taking the next steps. 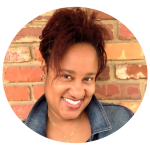 Your webinar content needs to naturally flow to the sale of a product or service. So, before you can create the webinar content, it’s a good idea to define the product or service you’re going to pitch. It’s easy to create a webinar with content that solves a problem and leads to a solution, which you then make available to your audience for purchase. However, if content is all one sided, you’ll have participants that start multi-tasking and not paying attention. You can lose them. Webinars needs to provide interactive features to keep your viewers’ attention and discourage them from leaving or losing attention. Your audience expects that you’re going to pitch a product or service. Don’t try to hide that. Be completely transparent and embrace your pitch. It shouldn’t be a hard sell but you’re probably giving them a special promotional offer and you’re proud of your product or service so pitch with pride. Position the heaviest, most valuable, content up font – to get people engaged right away and for those who have limited time to spend with you. Add mini-pitches throughout. Find a few spots in the middle where you can gently pitch to attendees. Again, this helps you grab people if they have to leave early and it may get some sales rolling in before the end of the webinar. Make your big offer at the end. It’s okay to be direct with your call to action. As mentioned, your attendees are expecting it and if your content has done its job, then they are looking for it. Finally, make sure that you use good technology and that you’ve conducted a run through PRIOR to going live. The more professional your webinar, the better your sales will be. Keep track of all the moving parts of a webinar with this checklist, and stay organized throughout the entire webinar planning process. From identifying your product all the way through marketing your webinar, use this all-inclusive planning checklist every time you create a webinar. This fill-in-the-blanks template will help you quickly create a webinar signup page with all the necessary information you need to show your prospects so they sign up for your webinar. We’ve also included a sample sign up page, so you can get more ideas flowing! Thank your readers for signing up for the webinar with this fill-in-the-blanks template. 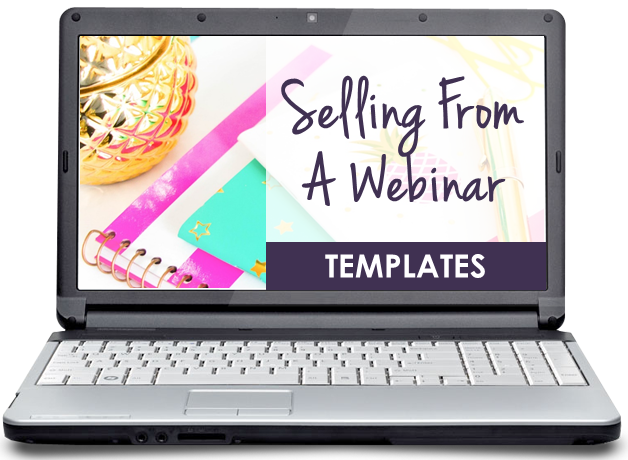 Use this template to not only provide them with the details of your webinar; ensure your customers have all of the information they need so they will attend your webinar live. We’ve also got a sample there for you to take a look at. No more guessing how to structure your webinar. We’ve got everything included here from the welcome and introduction, providing stories and social proof, all the way down to your closing. I’ve included some great tips that many people miss, so be sure and follow this detailed outline. This webinar template is going to give you an amazing starting point. 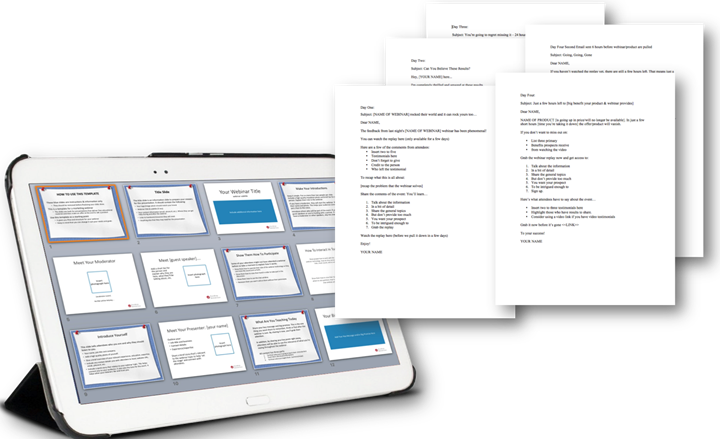 You won’t need to worry about staring at blank slides anymore. This template gives you everything you need, just update it to fit your topic. It is also full of tips on how to get your attendees involved and actively listening. Use this template to ask affiliates to promote your upcoming webinar. It’s not enough to ask, however, you need to give them as much detail as possible so they can decide if it’s worth their time and effort. That’s where this handy email template comes in. Just plug your specific details and you are good to go. You can’t just send one email out and expect people to sign up for your webinar. Use this series of five emails to help promote your webinar and create buzz. These emails work and are proven to get you sign ups. Given all the emails people receive these days, it’s a good idea to remind them and keep reminding. You’ll be surprised how well this works with last minute signups.